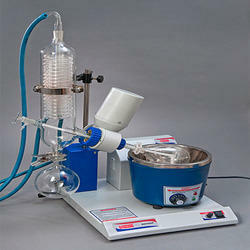 Supported with skilled personnel, we are involved in providing an excellent quality array of Rotary Vacuum Evaporator. This model of evaporator is supplied complete with geared drive unit offering smooth speed control by analog knob, jack arrangement fitted on base unit for positioning glass assembly. In order to perfectly design the offered product, our skilled personnel make use of the best quality raw material and sound techniques according to the set industry parameters. Each product is tested making use of excellent testing machines and technology under the supervision of our skilled quality controllers. 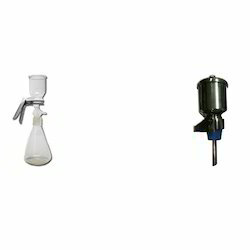 We are precisely manufacturing and supplying an excellent quality assortment of Catalytic Hydrogenation Apparatus that is available in assorted specifications. It is designed by our veteran personnel keeping in mind modern market trends. Our skilled quality controllers strictly test the entire array of products on assorted parameters before offering at customers' end. Moreover, the offered product is available in assorted customized options as per their requirements. R/250/03 Temperature control unit: for heater, operated by a knob, continuously variable. 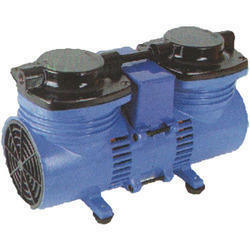 Owing to our great expertise, we are involved in manufacturing and supplying a wide assortment of Oil Free Vacuum Pump. The offered product is designed by utilizing optimum grade raw material and ultra modern techniques according to the set industry parameters. In order to make sure its quality, the offered product is accurately scanned on assorted parameters by our talented quality controllers. This pump is highly demanded in the market for features given below. 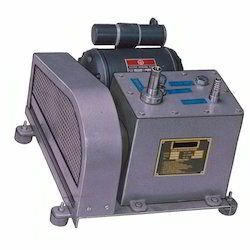 We are the prominent manufacturer and supplier of the best quality array of Oil Sealed Vacuum Pump. This product is manufactured utilizing the best grade raw material coupling with most advanced techniques, under the supervision of our skilled personnel. Further, in order to offer a flawless range at clients’ end, each product is well-tested on assorted parameters by our talented quality controllers. 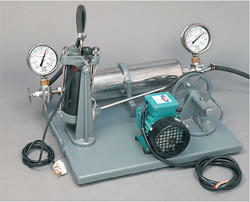 Clients can purchase the offered pump from us at market leading prices. a) Spreader (Applicator) made of electroplated brass. of size 20 x 20 or 10 of 20 x 10 cm. and two plates of 20 x 5 cm. c) Drying plate rack anodized aluminium for ten 20 x 20cm. plates. e) Developing tank with lid. Ten 20 x 10 cm. and two 20 x 5 cm. plates. g) Micro pipette corning glass. i) Glass Sprayer with rubber bellow. R/340/02 Draining rack for holding washed plates in angular position so that water can drop off over corner of wet plates before coating. R/340/AL Drying plate rack made of anodized aluminium for plates of 20 x 20 cm. Sealed against air humidity. Size: 38 x 23 x 20 cm. P.S. : We can supply Handy models with battery back up at extra cost. U.V. Chromatography inspection cabinet for viewing and detecting separated substances on T.L.C. layers fitted with long wave (365nm) U.V. Source for use on 230 V.A.C. U.V. Chromatography inspection cabinet for viewing and detecting separated substances on T.L.C. layers fitted with short wave (254nm) U.V. Source for use on 230 V.A.C. Heating Mantle with temperature control arrangement by energy regulator single size, these mantles are made to accommodate several sizes of round bottom and flask to provide uniform heating bigger size of mantles have two or three circuits so that upper circuits could be switched to when smaller size of flask is being heated or when the liquid level drops. Test mantles provided a maximum surface temperature of 400C working on 230 volts AC single phase. 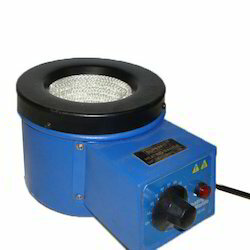 Made of SS lid, funnel, base and clamp having filter support screen, silicon gasket and Teflon sealing ring in the lid. 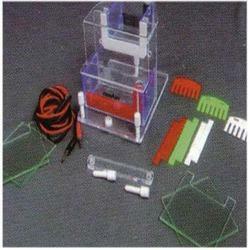 Used in microbiological quality control as well as for analytical determination e.g. of metal particiles in lubricating oil, iron oxides in boiler water. Dimension (lxwxh) 145x205x155mm, power required 100v, 25ma. Time consumed 2-3 hrs. Buffer required 200+50ml. 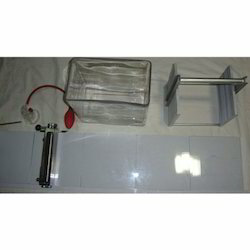 Complete with buffer tanks and safety lid, removable platinum electrode, glass plates (2sets) spacer (6nos), acrylic com (3nos), connection cords and user guide. Gel size 15x15cm. Power required 150v, 100ma. Time consumed 2-3 hrs. Complete with basic unit and lid, removable platinum electrode, running tray, gel casting tray, combs (4 nos), connection cords and user guide. Gel size 15 x 15cm. Dimension (LxWxH) 255x175x80mm. 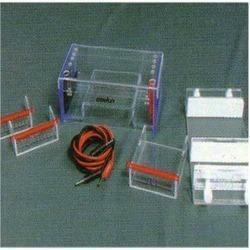 Gel platform (mm) 150x150 (1nos), 75x150 (2nos), 350ml Buffer sample required. Power required 200v, 50mA. 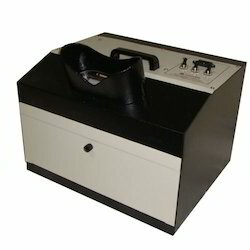 Looking for Superfit Laboratory Instruments ?